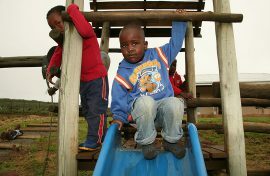 Heaven’s Nest Child Care Recreation Centre provides emergency foster care to children identified as “children in need”: those infected by HIV/AIDS as well as those who have been orphaned, neglected or abused. The children placed at Heaven’s Nest arrive in various stages of trauma and compromised health. They are monitored twenty-four hours a day by staff who provide round-the-clock care. As they oversee the medical, educational and physical needs of the children, Heaven’s Nest creates an environment where they can live free of the fear of prejudice and rejection that arises culturally for those associated with HIV/AIDS. With the number of orphans in South Africa continuing to rise to record highs, research reveals that these children live in impoverished conditions in which survival is a daily struggle. Filled to capacity, Heaven’s Nest has been forced to turn away children due to lack of space. To improve the educational component of their services, Heaven’s Nest developed plans to formalize their education program and construct a classroom on their property. The most recent grant from South Coast Foundation contributed towards the construction and furnishing of a classroom. Operating in association with St. Francis of Assisi Anglican Church and the Fikelela Aids Project, the Centre’s mission is to alleviate the plight of these children through support, care and counseling in preparation for re-integration into a family or placement in foster homes or adoptive care. In addition to caring for the children, Heaven’s Nest runs a soup kitchen that feeds nearly two hundred people. Eleanor Bester, the project manager, is the heart and soul of this Centre, dedicating her life to its mission.